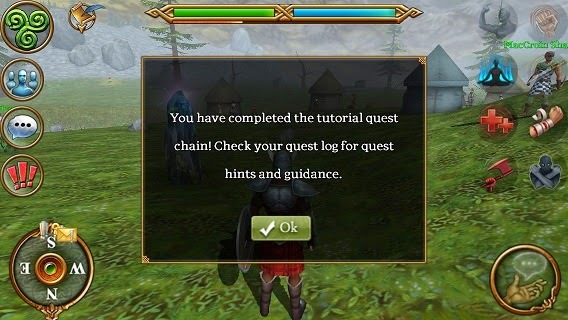 This guide will walk you through all the steps to finish the beginning quest chain, from the moment you arrive on the docks to when you finally leave Lir's Reach. 6. Tap "I'll defeat a Pict"
7. Follow the arrow in front of you to a mob with crossed swords over it, named "Darkfell Pict". 11. Follow the arrow to the Question Mark on your compass in the bottom left. Don't worry about fighting any mobs in front of you. Any mob with a yellow name will not attack you. Mobs with red names will. 13. Tap "I've driven back the Picts"
14. Tap "I'll get the torches"
16. Follow the arrow to the Darkfell Flamebringers that have the crossed sword icon over their heads, and defeat two of them. 17. Follow your arrow to Andra the Scout, and talk to him. 18. Tap "Here are the torches"
19. Tap "I'll destroy the barrels"
21. Follow the arrow to Captain Ross and talk to him. 23. Tap "I'll talk to Arnhuin"
24. Upgrade your stats in the stats menu. 25. Follow the arrow to Sergeant Arnhuin, and talk to him. 27. Tap "I'll defeat the wolves"
28. Defeat 3 Dark Wolves that have the crossed sword quest objective icon over their heads. 29. Return to Arnhuin and talk to him. 30. Tap "I have", and then "I'll go to Farcrag Castle". 31. Upgrade your stats in the stats menu. 32. Follow the arrow, and run up the hill to enter the castle. 33. When you get to the door, tap OK to enter the castle. 34. Talk to Gate Captian Grun. 35. Tap "The Curse", "Lord MacLir", The Grand Tour", and "I'll talk to Sandow". 36. Follow the arrow and talk to Sandow the Strong about upgrading stats. When you are done tap "I'll talk to Nairn"
37. Follow the arrow and talk to Nairn the Guard about PVP combat. When you are done tap "I'll talk to Vika"
38. Follow the arrow and talk to Vika the Skilled about upgrading skills. When you are done tap "I'll talk to Segna"
39. Follow the arrow and talk to Segna the Scholar about leystone travel. When you are done tap "I'll talk to Blaze"
40. Follow the arrow and talk to Blaze the Duellist about duelling. When you are done tap "Finish tour" and "I'll talk to him"
41. **Note** This is where the quests start to vary by class. This guide is written from the perspective of a Warrior. The names of the quests and skills will be different for each class. 42. Follow the arrow and talk to Lord MacLir. Tap "That's right", "What other treats? ", "Protective Stance", and "I'll speak to him." 43. Follow the arrow to Broc the Warrior (or your class specific quest NPC) and talk to him. Tap on "Yes please." 47. Tap the return arrow button in the top left corner of the screen. 48. Tap "I'll practice the skill"
49. Tap the main menu icon (three swirls) in the top right of the screen. 54. This brings you automatically to the skill menu, where it automatically equips the new skill in your action bar. 55. Tap the return arrow button in the top left corner of the screen. 56. Tap the new skill that has been added to your hotbar. 57. Talk to Broc the Warrior (or your class specific quest NPC). Tap "I have" and "Goodbye"
58. Follow the arrow to return to Lord MacLir, and talk to him. Tap "I have", "The road to Crookback", "How can I help? ", "I'll do it", and "I'll talk to Eustace". 59. Exit the castle by walking to the front gates, following your arrow. 60. Follow the arrow and talk to Eustace the Scout, tapping through the dialogue. 61. Follow the arrow and talk to Ranger McKay, tapping through the dialogue. 62. Defeat 4 Crookback Caveguards maked with the crossed sword quest objective icons above their heads, on your compass, and on your map. 63. Return to Ranger McKay and talk to her, tapping through the dialogue. 64. Tap the main menu icon (three swirls) in the top right of the screen. 69. This brings you automatically to the skill menu, where it automatically equips the new skill in your action bar. 70. Tap the return arrow button in the top left corner of the screen. 71. Tap an enemy, and then tap the new skill that has been added to your hotbar. Defeat the enemy if needed. 72. Return to Ranger McKay and talk to her, tapping through the dialogue. 73. Turn around and walk to the entrance in the rocks to enter Crookback Hollow. Tap OK on the popup window to enter. 74. Talk to Boris the Sneaky, tapping through the dialogue. 75. Walk forward to the next cave section and retrieve 3 barrels of Blackhearth Ale. 76. Return to Boris the Sneaky and talk to him, tapping through the dialogue. 77. Run to the next chamber of the cave and defeat Grimbreath the Plunderer, retrieving his map. 78. Return to Boris the Sneaky and talk to him, tapping through the dialogue. 79. Run forward toward the Question Mark on the map, and talk to Morden, tapping through the dialogue. 80. Defeat two Crookback Spies, and return to Morden. Tap through the dialogue. 81. Run to the chamber to the East, and collect the three chests on the ground labeled Morden's Bribes. 82. Go to each of the three question marks on the map (Wotsit the Guard, Crotchet the Guard, Niblet the Guard), and talk to them, tapping through the dialogue. Return to Morden. 84. Return to Ranger McKay in Lir's Reach, just outside of Crookback Hollow. Tap through the dialogue. 85. Tap the main menu icon (three swirls) in the top right of the screen. 86. Tap on the Map button. 87. Find the Question Mark icon in the group of buildings on the map. Tap on the leystone label that is closest to it. This may be Highshore Village if you have gotten this Leystone, but if not tap on Crossroads. 88. Run to the Question Mark, and talk to Mirain the Seer. Tap through the dialogue. 89. 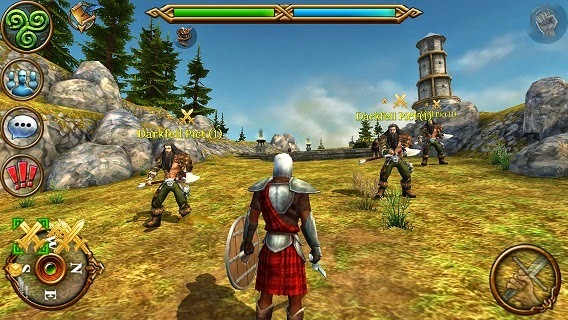 Defeat 3 Blackstone Assassins in the field behind the village, marked by Crossed Swords on the map. 90. Return to Mirain the Seer and talk to her, tapping through the dialogue. 91. Open your inventory, and use the Meditate skill book. Close your skill page and use the Meditate skill. 92. Return to Mirain the Seer and talk to her, tapping through the dialogue. 93. Run to the hill between the Southern field behind the village, and the Temple of Belenus. 94. Pick up 3 Red Wanderer Mushrooms from the ground. 95. Return to Mirain the Seer and talk to her, tapping through the dialogue. 96. Go South of Highshore village, and defeat a White Stag, looting its antler. 97. Return to Mirain the Seer and talk to her, tapping through the dialogue. 98. Go North of Highshore village, and defeat a Watcher, looting an Eye of the Watcher. 99. Return to Mirain the Seer and talk to her, tapping through the dialogue. 100. Go South of Highshore village to the Temple of Belenus, and talk to Sergeant Grumpshot. 101. Go South of the Temple of Belenus, up the hill to the Flintblade Bandit Camp. 102. Enter the camp, and pick up the 4 chests of Military Supplies inside the tents. Watch out for the Flintblade Lootguards, and Harry Flint! 103. Return to Sergeant Grumpshot and talk to him, tapping through the dialogue. 104. Run East to the Tavern, and talk to Faolan MacLir. 105. Open your inventory, and use the Recuperate skill book. Close your skill page and use the Meditate skill. 106. Return to Faolan MacLir and talk to him, tapping through the dialogue. 107. North of the tavern, defeat 5 Skullcrusher Scouts, marked by the crossed sword icons. 108. Return to Faolan MacLir and talk to him, tapping through the dialogue. 109. North of the tavern, and just South of the Stone Circle, defeat 2 Jotun Hammerers, marked by the crossed sword icons. 110. Return to Faolan MacLir and talk to him, tapping through the dialogue. 111. Open your inventory, and use the new skill book. Close your skill page and use the skill. 112. Return to Faolan MacLir and talk to him, tapping through the dialogue. 113. Defeat the 3 scryers around the stone circle in Lir's Reach, looting the skulls they hold. 114. Return to Faolan MacLir and talk to him, tapping through the dialogue. 115. Go the the camp on the peninsula to the North of the Stone Circle, and defeat Hagvar the Hairy. 116. Return to Faolan MacLir and talk to him, tapping through the dialogue. 117. Return to Mirain the Seer at Highshore Village and talk to her, tapping through the dialogue. 118. Go to Beathan the Druid at the Temple of Belenus and talk to him, tapping through the dialogue. 119. Talk to Bronwen the Druid at the Temple of Belenus and talk to her, tapping through the dialogue. 120. Go to the graveyard and gather 3 Wight Essences by defeating Grave Spirits. 121. Return to Bronwen the Druid and talk to her, tapping through the dialogue. 122. Talk to Beathan the Druid, tapping through the dialogue. 124. Talk to Tyric the Druid at the Withered Vaults leystone in the Catacombs. 125. Defeat Vazak the Bodyguard, and Nimel the Bodyguard (level 22/3*). 126. Return to Tyric the Druid at the Withered Vaults leystone in the Catacombs, and talk to him. 127. Head into the Northern section of the Catacombs, and talk to High Druid Cannonach at the Death's Caress leystone. 128. Head East from Death's Caress, and destroy the Obelisk of Crom. 129. Return to High Druid Cannonach at the Death's Caress leystone, and talk to him. 130. Head West from Death's Caress, and defeat the Manus Blackstone (lvl 28/3*). 131. Return to Lord MacLir in Farcrag Castle, and talk to him. 132. Go to Lir's Reach and run South past Crookback Hollow to the Southern Pass leystone, and talk to Corporal Gudgeon. 133. Defeat 4 Connacht Scouts (lvl 29/2*) on the hill behind Crookback Hollow. 134. Return to Corporal Gudgeon at the Southern Pass, and talk to him. 135. Head South and enter Shalemont Ravine.